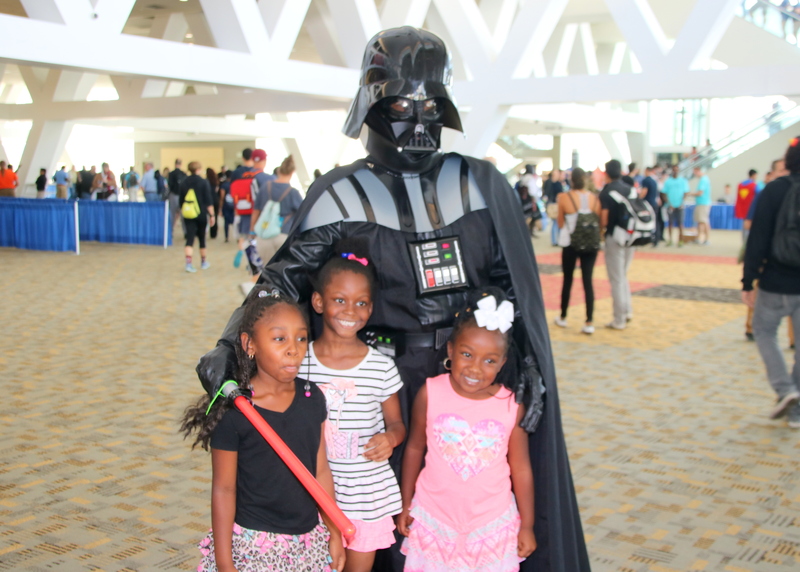 Thousands flocked to the 18th annual Baltimore Comic-Con this weekend to meet iconic actors and writers for well-known comics and movies and of course to show off homemade costumes of classic and contemporary superhero legends. Some of the notable guests included Frank Miller, the Maryland-born writer known for Sin City and the original comic version of 300, and a panel with Marvel editor Tom Brevoort and writer Mark Waid discussing the future of Marvel comics. One theme in upcoming issues of Captain America, Waid hinted, will be a response to the white supremacist, alt-right protests in Charlottesville. “Captain America will be traveling around the U.S., and while he might not be punching Nazis in the first issue, I promise it will happen soon,” Waid said in his panel, to the applause of a few hundred fans. He added that fighting against racism would also be a theme in upcoming issues of Champions, a newer series that features a mix of young super heroes both new and old. While not as big as the behemoth of San Diego Comic-Con, Baltimore’s gathering has a local feel that many cherish. It’s not uncommon to be standing in line for a panel when suddenly someone realizes a childhood friend or co-worker is across the aisle dressed in a similarly colorful costume. 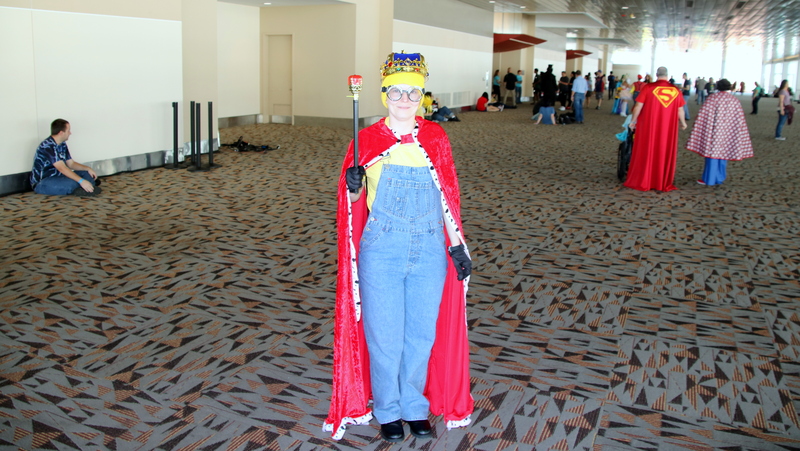 And outside the Baltimore Convention Center, Comic-Con was revisited by a mainstay of Baltimore conventions such as BronyCon and Otakon – the Ice Cold Water Man. He was out was there today, hawking his watery wares with his catchy catch-phrase. On a blasting hot September day, we needed him. BELOW: Some scenes from the day. All photos for Baltimore Brew by Louis Krauss. 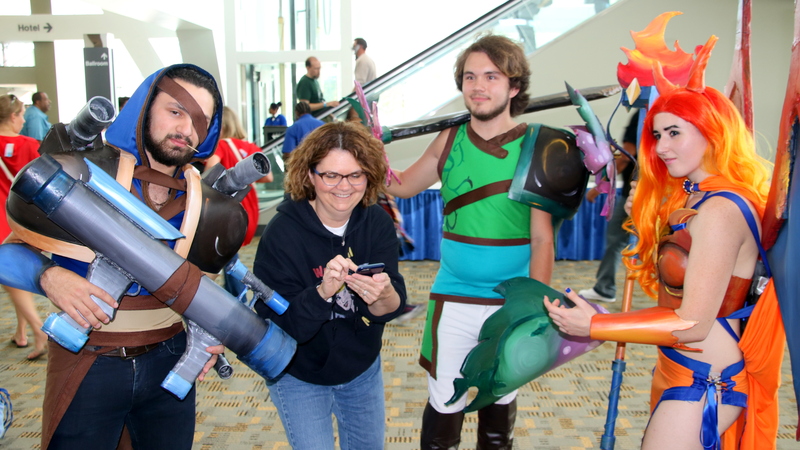 An attendee is surrounded by human versions of the Pokemon Blastoise, Venusaur and Charizard. 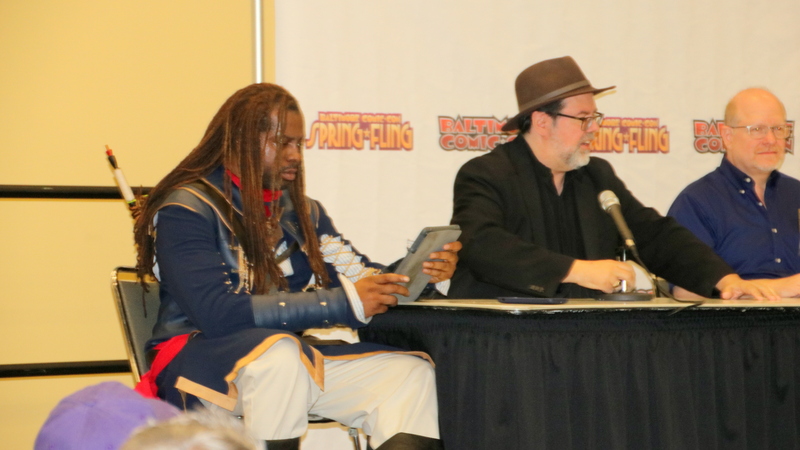 During a panel, Marvel editor Tom Brevoort (center) invited a fan dressed as Bishop to read the unreleased first issue of Marvel Legacy. 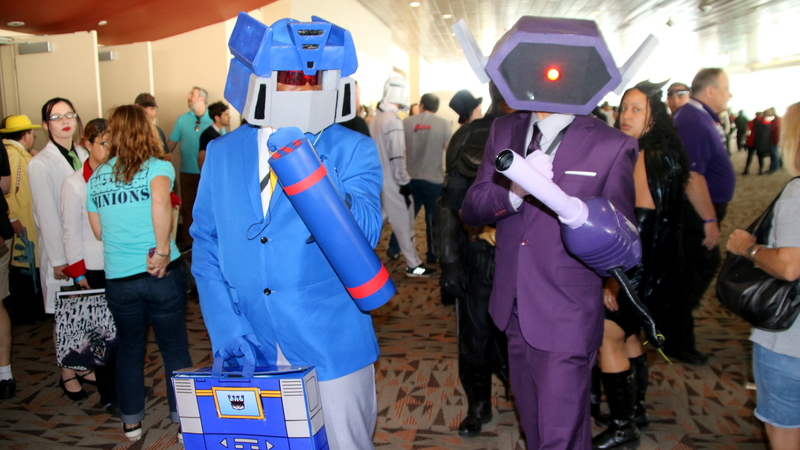 A couple of the original Transformers stepping up their game. “We’re here to be stylish,” they said when asked about the suits. Snake, Harley Quinn and Spidey. Darth Vader gets warm and fuzzy.